1. Which of these best describes the population growth shown in the graph? A. On day 1, the resources of the population limit its growth. B. On day 2, the birthrate per individual is greater than on day 1. 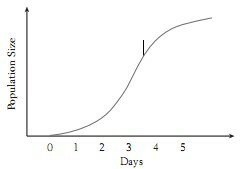 C. On day 3, the population size is equal to K.
D. On day 4, the curve is most similar an exponential growth curve. E. On day 5, the number of deaths approaches the number of births. 2. Compared to a country that has undergone demographic transition, a country that has NOT undergone this transition has which of the following? 3. Which of these examples is represented by the Type III curve shown? A. Most redwood seeds are eaten, but a few produce trees that live for decades. B. The growth of a bamboo stand slows as space becomes limited. C. The probability of a squid being captured and eaten is independent of its age. D. The growth of a bacterial colony increases as new individuals are produced. E. A few pandas are born in a population, but they survive through adulthood. 4. Which of these relationships results in harm to one of the species involved?